We are the Supplier & Distributor of Freeze Dryer. We are among the renowned organization that manufacture, import, export and provide service of a wide range of superior quality Freeze Dryer. This is simply a dehydration process characteristically used to protect a consumable and make it more suitable for transport. These are manufactured and developed using top grade components that are quality tested to deliver a flawless range to the clients to meet the demanding requirement of the clients. We are providing our products around every part of the world at economical prices. Electric Heating Freeze Dryer is freeze-dried in situ. It changes the traditional complicated operation, prevents the pollution of the material and realizes the dry sublimation automation. 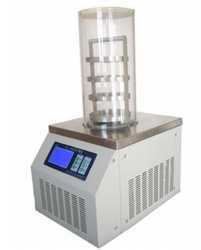 The freeze dryer has heating and programmable function. 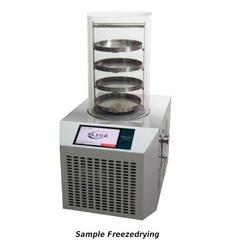 It may remember freeze drying curve so the users can observe freeze-drying process of material. 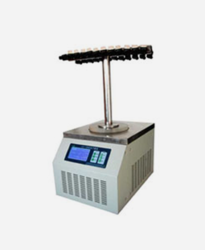 We are a trustyworthy organization offering a wide a gamut of Freeze Dryer Instruments. 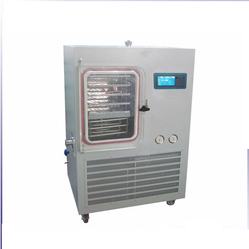 Common Type Desktop Freeze Dryer is applicable for freeze-drying test of laboratory samples and suitable for small amount of production. FD-10 series include the following types: Regular type, Top-press type, multi-manifold T type and multi-manifold Top-press type. Multi Manifold Top Press Desktop Freeze Dryer is applicable for freeze-drying test of laboratory samples and suitable for small amount of production. FD-10 Series include the following types: Regular type, Top-press type, multi-manifold T type and multi-manifold Top-press type. We are a trustyworthy organization offering a wide a gamut of Sample Freeze Drying.